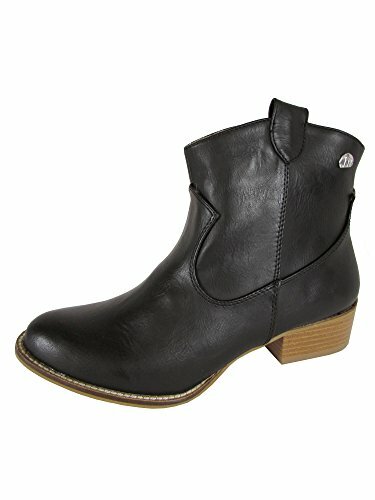 Ladies -- looking for a solid pair of vegan cowgirl boots to buy? You're going to love these 10 options made from faux leather along with other man-made and synthetic materials. 10. Black Split Cuff Western Ankle Bootie with Heel Buckle by Qupid. 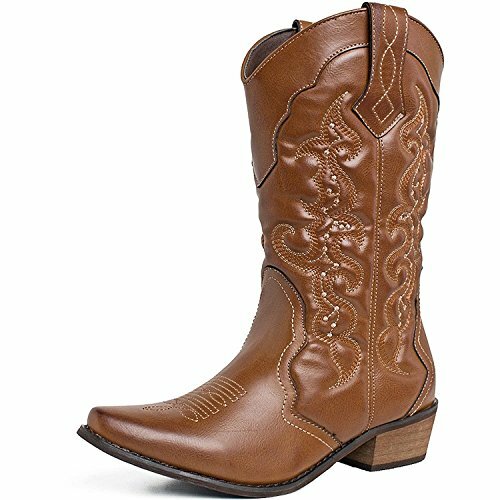 These cowgirl boots have a rubber stacked heel, pointed toe and classic stitching in contrasting brown and white thread. Pros: Very affordable for a cowgirl boot and versatile — can be worn with jeans or a party dress. Cons: A little pricey and said to run small. 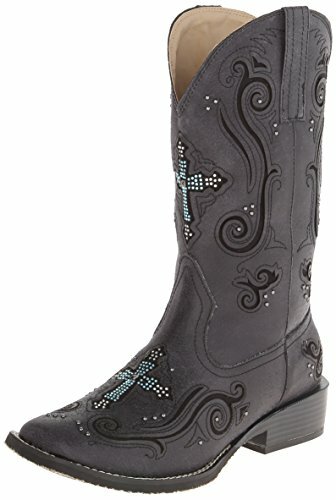 The eagle stitched onto the toe and winglike embellishments on the shaft are a creative take on cowboy boot stitching. Advertised as Vegan: They're not called vegan but "faux black vamp" (with faux leather). Pros: Light-weight with decent arch support. Cons: Heel looks like wood but is actually rubber (this, of course, is only a con if you prefer real wood). These bejeweled boots are built for comfort and beauty with a low stacked heel, swirling cut-out patterns and ornate crosses on the front and back. Advertised as vegan: No, but they're listed as "man-made." Pros: Light with a flexible sole and roomy calf. Cons: Some reviewers have found them fragile. The cowgirl look of these booties is understated with muted western-style stitching and stacked stiletto heels that look like wood. Advertised as vegan: No. They're described as synthetic. Pros: They have a "lightly padded" footbed. Cons: They may not have the same comfortable, extended wear-time as traditional cowgirl boots. Great for everyday wear, these antiqued gray boots with subdued shine combine simplicity and chic style. Advertised as vegan: No. They're described as synthetic leather. Pros: The zipper should make them easy to put on and take off. The distressed faux leather strikes a nice balance with the glittery fabric showing through detailed cut-outs. Advertised as vegan: No. All parts listed are made of faux leather, rubber and man-made materials. Pros: With the cushioned footbed, reviewers have found them quite comfortable right off the bat. Cons: They're moderately expensive, and some customers wished the faux leather looked more real. A silver-studded cowgirl boot the King of Rock and Roll would approve of. 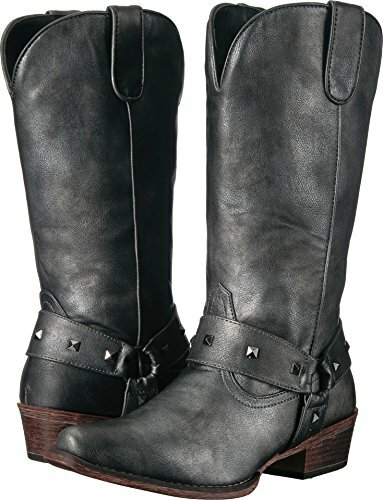 Advertised as vegan: The seller doesn't say they're "vegan," but all parts are faux leather or man-made materials. Pros: Reasonably affordable, all-day comfort. Cons: A white boot may need frequent cleaning. A soft synthetic suede upper add coziness and style to these boots with braided cuff, embroidered diamond design and low stacked heel. Advertised as vegan: No, but they're made of synthetic leather and synthetic suede. Pros: Cushioned insole and rubber heel cap for grip. Cons: We couldn't find any cons or reported negatives. With a low chunky heel and studded harness straps, the biker chick meets cowgirl vibe of these boots can be rocked in the urban jungle or on a country road. Pros: Flexible sole and padded insole. Cons: We couldn't detect any cons. Western style gets a modern update in these split-cuff faux leather ankle booties with stacked heel, almond toe and buckle strap around the heel. Advertised as vegan: No, but the description says faux leather, textile and "other materials." Considering that Asos lists any leather parts as "real leather," we assume that "other parts" are synthetic or otherwise not animal-based. Pros: Easy to clean. Just use a damp cloth. Cons: The exposed ankle may make for a limited season if you live in a wintry climate.